Shoetopia is the ultimate book on designer shoes, exploring the ever-evolving world of footwear and the creative designers in it. Footwear design continues to be one of the most important and interesting areas of the fashion industry. 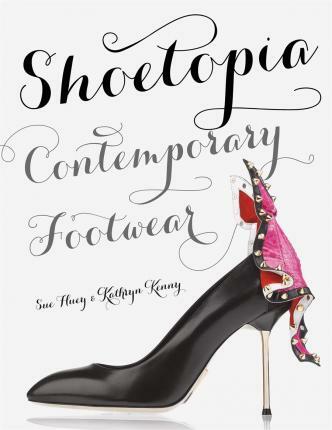 This stunning book showcases the most exciting and innovative contemporary footwear designers from across the globe, from established, world-recognized brands like Jimmy Choo and Prada to the stars of the future. From traditional skills to extraordinary new developments in the industry, the book features original design sketches and beautiful photography, bringing together a rich array of desirable footwear. Sue Huey is a former Head of Footwear and Accessories at Worth Global Style Network. She previously worked as footwear and accessories designer for a leading international fashion house. She is the author of two books: New Shoes and Bag, both published by Laurence King. Kathryn Kenny is a graduate of the prestigious footwear college Cordwainers. In her varied career she has worked as a footwear trend consultant for Worth Global Style Network and a shoe designer for Georgina Goodman. She is now Digital Content Manager for high-street fashion retailer New Look.